Orangeburg County vital records, maintained by the Orangeburg Public Health Department Vital Records office, are available to family members only for births and deaths 1915-present. Orders must be in person or by mail, with identification, or online through VitalChek. The $12 fee includes both a search and/or certified copy. Death records prior to 1961, and all vital records 1641-1914 are available at the state Department of Archives and History in Columbia. The state Department of Health website provides a free index for 1915-1960 deaths. 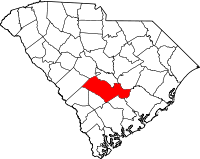 Orangeburg District dates to 1769. Historical marriage records pre-1950 are available from the county Probate Judge, and divorce records post-1949 from the County Clerk.